The 1984 United States presidential election in Hawaii took place on November 6, 1984. All 50 states and the District of Columbia, were part of the 1984 United States presidential election. Hawaii voters chose 4 electors to the Electoral College, which selected the president and vice president of the United States. 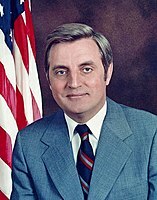 Hawaii was won by incumbent United States President Ronald Reagan of California, who was running against former Vice President Walter Mondale of Minnesota. Reagan ran for a second time with former C.I.A. Director George H. W. Bush of Texas, and Mondale ran with Representative Geraldine Ferraro of New York, the first major female candidate for the vice presidency. Hawaii weighed in for this election as 7% more Democratic than the national average. As a result of Reagan's victory in Hawaii, he became the second Republican presidential candidate to win to win Hawaii as well as the first won since Richard Nixon in 1972. 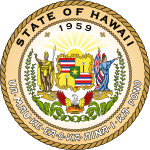 As of the 2016 presidential election[update], it is the last time Hawaii has voted for a Republican in a presidential election, making Hawaii one of six states Reagan was the last Republican to win; the others being Massachusetts, New York, Oregon, Rhode Island and Washington. The presidential election of 1984 was a very partisan election for Hawaii, with just under 99% of the electorate voting for either the Democratic or Republican parties. All four island districts in Hawaii voted in majority for President Reagan, a stand-alone event in the State's history. As of the 2016 presidential election[update], this is the last election in which any of Hawaii's counties voted for the Republican candidate. Some of these new policies also arguably curbed several existing tax loopholes, preferences, and exceptions, but Reaganomics is typically remembered for its trickle down effect. Reaganomics has (along with legislation passed under presidents George H. W. Bush and Bill Clinton) been criticized by many analysts as "setting the stage" for economic troubles in the United State after 2007, such as the Great Recession. Reagan won the election in Hawaii with a decisive 11 point landslide. The election results in Hawaii are reflective of a nationwide reconsolidation of base for the Republican Party which took place through the 1980s; called by Reagan the "second American Revolution." This was most evident during the 1984 presidential election. No Republican candidate has received as strong of support in the American Pacific states at large, as Reagan did. This is also the most recent election cycle where Hawaii sent Republican electors to the Electoral College. Reagan also enjoyed high levels of bipartisan support during the 1984 presidential election, both in Hawaii, and across the nation at large. Many registered Democrats who voted for Reagan (Reagan Democrats) stated that they had chosen to do so because they associated him with the economic recovery, because of his strong stance on national security issues with Russia, and because they considered the Democrats as "supporting American poor and minorities at the expense of the middle class." These public opinion factors contributed to Reagan's 1984 landslide victory, in Hawaii and elsewhere.